Is it time to address the unconscious patterns behind your anxiety? Do you suffer with nagging doubt and worry which is ruling your life? Do you often think of the worse case scenarios or outcomes? Do you find your fear debilitating, and struggle to manage your stress? Does your anxiety keep you from living a full and happy life? You may have been suffering with the symptoms for many years, and have tried a number of different treatment options without success? Have you ever considered trying hypnotherapy for anxiety? Anxiety arises over time, and can be complex to treat. Whilst many people turn to drugs and medication to treat the symptoms of anxiety, these solutions are unable to treat the actual causes nor change the type of thinking that leads to anxiety. The chronic worry and stress experienced by those who suffer from anxiety makes it difficult to lead a full and happy life, and yet many people continue to suffer in silence. Keeping up appearances and trying to ‘manage’ anxiety without treatment can be a recipe for disaster, and can even lead to further problems such as depression and self-harm. Those who suffer from anxiety often have no idea why they feel so anxious, and therefore do not understand the underlying causes of their anxiety. Every anxiety sufferer experiences different symptoms, yet it is important to understand that you are not alone, and that it is not uncommon. In fact, as many as 2 million Australians currently suffer from anxiety. Anxiety is also the result of living in fear or constantly worrying about what may or may not happen – the ‘what ifs!’ Fear builds up often from something that has happened in our past, or that we have perhaps observed, and we expect a negative event or outcome will happen in the future. Catastrophizing is a common cognitive distortion linked to anxiety; when you catastrophize, not only do you imagine a negative outcome may happen, you often also assume that the negative outcome is going to be a catastrophe. If you have been experiencing the symptoms of anxiety, or have suffered from one or more of these situations, hypnotherapy for anxiety may be the solution which gives you back control over your life. Unlike treatment with medication, hypnotherapy treatment for anxiety does not lead to uncomfortable side-effects. Where medication can take away your power and leave you feeling out of control, hypnotherapy aims to give you back your power by conquering the underlying issues which have plagued you. Our Hypnotherapy for Anxiety program offers you a supportive and safe environment, to uncover the deep and underlying beliefs and behaviours which have been sabotaging your emotional state and well-being. Hypnotherapy is a proven, effective and safe technique which has helped many thousands of people to get to the root of their anxiety and finally develop real and valuable solutions to overcome them. 1. Identify the specific nature, triggers and/or patterns of your anxiety. 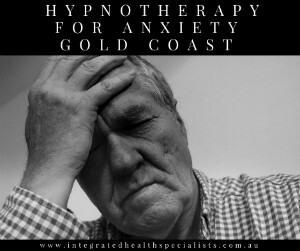 At Integrated Health Specialists, our Hypnotherapy for Anxiety program has helped many people to overcome their anxiety. CONNECT WITH US TODAY to find out more!